Stampin' Up! do it again! Not only have Stampin' Up offered us a fabulous deal on a Big Shot this month - but they have given you an amazing opportunity to join Stampin up for just £99 - but you get to choose £150 worth of wonderful crafting goodies! Yep that's right - £20 extra value in you starter kit! But this offer is only available for a VERY limited time - you have to join by 29th August to benefit from this deal. Most amazing of all is that you are under no obligation to purchase any other items - nor to hold parties, sell any items or do anything at all other than enjoy your purchases. But if you do want to start up your own independent demonstratorship - you will also receive everything you need to get going - PLUS by joining my team you will have access to advice and support. Interested? Why not email me and I can have a no pressure chat with you - answering all your questions. If you've already made your mind up - you can simply follow the links. 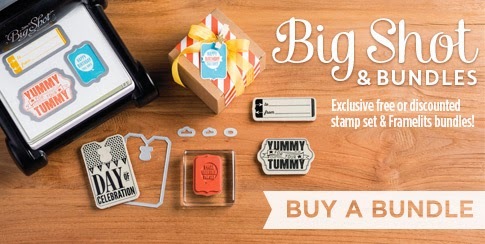 I just had to tell you abut this latest offer from Stampin Up!. For the month of August you can choose one of 5 special bundles (that's a stamp set and matching set of framelits) FREE. Which makes a Big Shot fantastic value - For £87.95 you can get your big shot and a bundle worth up to £47.50! You can even get your hands on one of our fabulous new Christmas Stamps before they are released in the new catalogue! Already got a big shot - no problem. You can chose one of these 5 bundles and receive a 15% discount off the normal catalogue prices. So everyone's a winner! Just head on over to my shop by clicking on the link on the left side of my site and have fun creating fabulous cards and gifts!